Congratulations and welcome first time home buyers! You have left the world of renting and are now entering the world of home buying. With this comes a lot of responsibility and a lot of paperwork. Before taking that first step to purchasing a house, you want to know what you’re getting into and why. Know the available options for houses, lenders, and loans. Military Mortgage Center will not only provide the groundwork for being informed, but also, offer some useful tips for first time home buyers and key factors to consider when buying your first home. As first time home buyers, not everyone finds the house they’ve always been dreaming about. In fact, almost no one does. There will always be something you see in every house that you wish was just a little different. Make a list of the top 5 to 10 features you cannot live without and learn to accept a few flaws in the less important features. That doesn’t mean you should settle for a dump—you shouldn’t—but don’t stress over wallpaper color. Flexibility in house shopping will save time and headache. Many factors contribute to the decision of which home to buy. Price, location, amenities, neighbors, and more. Keep a folder with all of the flyers from your potential houses and write in or highlight the advantages and disadvantages. Being organized about what you do and do not like in each home will help you make a more informed decision. You should also be organized with every document included in the whole purchasing process so that all the important information is easily accessible and in the same place. Mortgages are a part of life. Which loan you get determines whether or not these mortgages will be a struggle to meet each month. But you don’t need to get ahead of yourself! Just follow tip number 3, a sure way to stay on the right track! As a first-time home buyer, you first worry about approval and which lender to choose. Getting pre-approved should be the first thing you do, even before you start looking for a house. Your finances at this point are out in the open, and after talking with a lender, you’ll know exactly where your price limits are. Calculate other expenses into your plan. Many new home buyers fail to realize that payments include more than just your mortgage. Think about repairs, insurance, and HOA fees to name a few. With this new financial responsibility, the last thing you want to do is find yourself in a situation where you just can’t make a necessary payment. Don’t let these payments scare you too much! If you do have any worries, try looking into some of the financial benefits that come along with being a first time home buyer. Look into first time home buyer programs and grants that may provide down payment assistance. At times, the government has also offered assistance through tax breaks. Look into first time home buyer tax credits after purchasing a home to see if you can get a little more from your return. In the home buying process, you need a few different professionals on your side: a real estate agent, a VA loan officer, and maybe even a lawyer (though this isn’t always necessary). Going directly to the listing agent means there’s only one person on your side—you. Despite how much you might know about real estate, doing everything on your own is almost never a good idea. Get references or look at reviews for the lender and agent you think you want to go with. Try to find reviews for these lenders and agents on multiple review platforms. The lender and agent should cater to your needs, and knowing other buyers’ experiences will help weed out the good from the bad. And of course, you’re always welcome to call the professionals at Military Mortgage Center and rest assured that you’re in good hands. Once you have the proper people on your side and you’ve gone through the approval process, you have to decide which loan type will work best for you. Your lender will tell you what you qualify for and the benefits you’ll get from each program based on your individual situation. Military Mortgage Center deals primarily with VA home loans, so you should understand the two major options: fixed rate and ARM (adjustable-rate mortgage). As you can tell by the names, the major difference between these is whether the interest rates are fixed or adjustable. Of course, these will each have their own advantages and disadvantages. For example, ARM loans generally start out with lower rates than fixed mortgages, but these rates can rise over the years. Don’t get discouraged by all the information and huge numbers being thrown at you. The VA provides limits and guidelines that give you the most benefits with the least amount of hassle. This makes VA loans great for first time homebuyers. 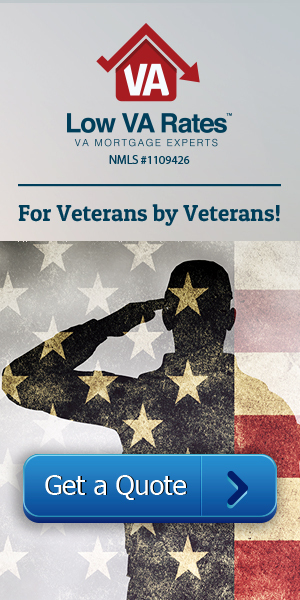 Let Military Mortgage Center help you discover if a VA loan is right for you!